This morning I was joined once again by Chris and Cooper Kerbow of Austin. Cooper’s largest fish today, this 3.125 lbs. hybrid he’s holding, came on a smoked slab, but, we also caught fish on topwater, casting swimbaits, and by downrigging. Chris owns the Georgetown Catfish Parlour restaurant where my wife and I are regulars (by the way, you need to go to if you’ve never been, and, while you’re there make sure you at least sample the jalapeno tartar sauce). Chris and his 12 year old son Cooper have made it an annual Fathers’ Day tradition to go on a guided fishing trip with me for 3 years in a row now. The topwater fishing has been very consistent, but, as the saying goes, the early bird gets the worm. The strongest action has been in the short window of time between first light and sunrise. Today we found fish between Areas 014 and 027 and caught them on Cork Rigs. Cooper really improved on his casting after shaking off the cobwebs in the first few casts. Releasing the line with his index finger at just the right time and following his lure to the water with his rod tip both helped him greatly. We boated 28 fish before the fish sounded and left the skinny water. We next experience a resurgence of topwater action in open water between Areas 836 and 837. In this scenario, short hybrid striped bass were nailing good sized 3.5″ threadfin shad after driving them to the surface. We switched over to soft plastic swimbaits that offered a slightly larger profile to “match the hatch” and did well here, as well as just to the S. of Area 835. At both areas, when the fish sounded, we continued catching by letting our swimbaits sink, and, when the fish showed deeper (in the lower 1/3 of the water column over ~40-45 feet) we used slabs and smoked these fish. Our two largest fish came on TNT 180 slabs in 3/4 oz. They were right on with the profile of the bait these fish were feeding on in this deep water. By around 8:45a, the fish were throttling back and so we went with a downrigging approach from that point forward to top off our day with a total of 84 fish boated. Our ‘rigging spread consisted at first with a pair of Pet/Licker combos. Later, we changed one of those out with a Swimmin’ Image and did just as well. All of our downrigging was done in the vicinity of Area 835, along the breakline. When this fishing went soft, we headed over to Area 214 and found a lot of bait, but it was relaxed and blanketing the bottom, not balled up and defensive. We managed our final fish, another short hybrid, here and then called it a day right at about 11am. As I drove away from the launch site, I left the two of them enjoying one of the swimming areas on Belton Lake. They had the whole beach to themselves! Wind: Winds were S3 at first light increasing to S6-7 by trip’s end . I fished Belton Lake this morning, once again joined by the crew from Rockpointe Church, including Pastor Shayne O., “Youth Guy” Mario, “Small Groups Guy” Shane M., and Shane’s daughter, Grace. Pastor Shayne landed our biggest fish of the trip today, an 18+ inch hybrid going right at 3.00 pounds. He’s flanked by (L-R) Shane, Mario, and Grace. Everyone got to cash in today on mixed-bag, mixed-technique angling. 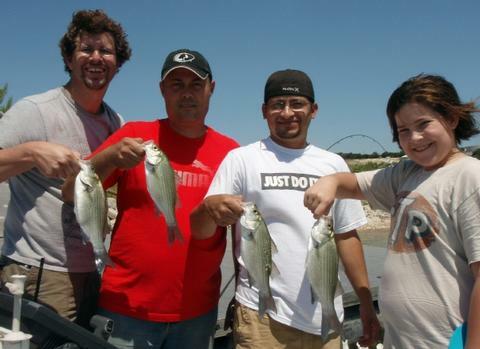 Here the Rockpointe crew displays our best 4 white bass just before releasing them. The winds were higher than forecast for this morning, in fact, there were already occasional whitecaps before sunrise. I had hoped to get this foursome on a solid topwater bite, but spotting the fish, much less keeping the boat constantly positioned well for four casters was a bit of a challenge. We did spot fish on the surface and we did manage to get everyone hooked up a few times over, but, it just wasn’t what it could have been with lighter winds. Regardless, we boated 13 fish in our first few minutes on the water, and the adrenalin definitely got going as we watched in anticipation of seeing “just one more school” of those fish blitz on the surface. This action cropped up between Areas 133 and 811 and was done by the time the sun peeked over the ridge to the north. As the fish sounded, they moved out to deeper water and we found them again along the 27-32 foot contour in an area “boxed” by Areas 085, 488, 834, and 812 to the N, S, E, and W, respectively. 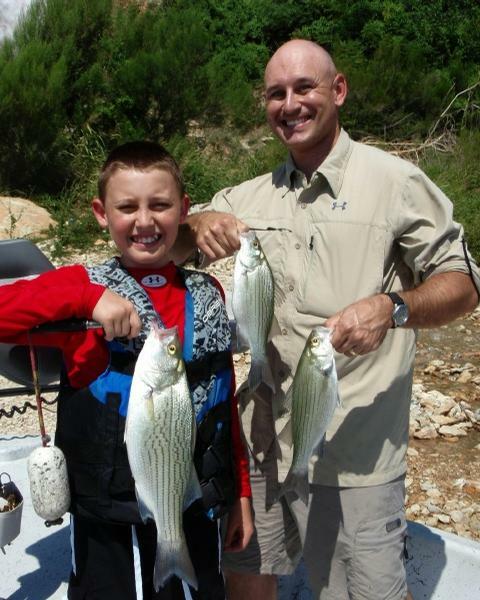 In this area we found multiple large schools of active, suspended fish consisting of white bass and hybrid stripers. The “drill” was to downrig for these fish (with a pair of tandem Pet/Licker combos) taking what we could of the scattered fish all over this area, and setting up in a hover over top of larger schools as they appeared on sonar to present slabs by way of “smoking”. We caught a mixed bag of whites and short hybrid by both methods and left this action only when the winds got so strong in this exposed area that we could no longer determine if we were getting strikes on our downriggers. By this time the smoking tactic had fallen by the wayside as the schools of fish began to breakup or settle down to the bottom and became too inactive to respond to a smoking technique. As we departed, our tally stood at 31 fish. We made a move to near Area 832 but, despite plenty of bait in and around the draw here, found only one hybrid, a just-keeper 3 pound fish. The balance of the trip was spent in a stretch of water between Areas 307 and 214. We found abundant life here in a band from 27 to 33 feet deep over a 35-43 foot bottom. There were schools of shad everywhere, and as we did a combination of downrigging and jigging (right on top of Area 833) we picked up largemouth bass, short hybrids, white bass, drum, and small blue cat. The drum proved particularly suseptible to a hard jigging approach with a slab worked just over their heads. Over approximately 2 hours we sacked up exactly 30 more fish in this area. Accolades once again go to Pastor Shayne. He earned the “Wanton Waste of Perfectly Good Fishing Equipment Award” today — it was an honest mistake, though. He saw the trolling motor working so hard keeping up with the wind that he felt it needed a mid-morning “snack” of 12 pound monofilament with a extra 3/4 ounce helping of slab thrown in there. He’s now a two-time qualifier for that distinction! Wind: Winds were at S12-13 by sunrise, increasing to and leveling off at S16-17 by 9:30am . Skies: Skies were fair, dry, and bright with 10% clouds. Today’s trip on Stillhouse Hollow Reservoir was the eleventh S.K.I.F.F. trip I’ve run for 2011. 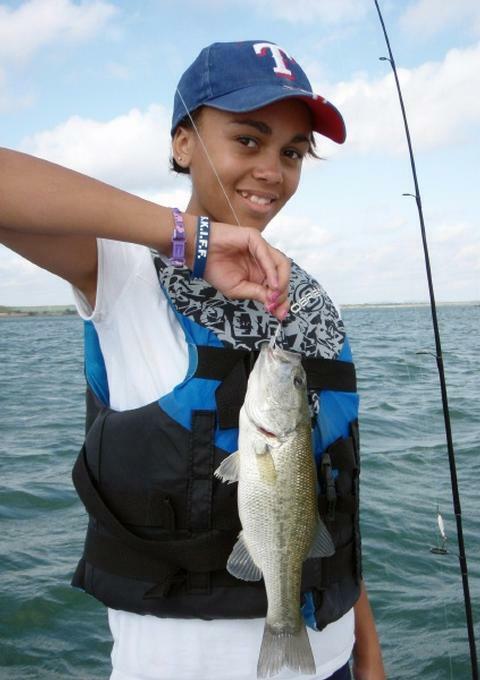 Brianna H. with a “schoolie” largemouth we caught on a flatlined Pet Spoon over 33 feet of water in rough waters this morning. Kailynn H. with a black bass that hit her Pet Spoon fished off of a downrigger at 29 feet over a 33 foot bottom in open water. Damian H. with one of many sunfish he caught after “breaking the ice” with his first fish ever this morning. This morning I met up with the Hampton family of Killeen and fished with the three oldest children of Amy and Damian Hampton. Damian is an enlisted man in the U.S. Air Force on a 1 year unaccompanied tour to Osan, Korea. I welcomed aboard Damian Jr. (6 yrs. old), Kailynn (11 yrs. old), and Brianna (12 yrs. old). Unfortunately, 3 year old Miss Vanessa had to sit it out until she gets a bit older. Little Damian had never caught a fish before, so, that became “Job #1”. Job #1 was placed in the “Got ‘er done” column about 6 minutes into the trip upon our arrival at a very active weedbed (at Area 832) holding lots of sunfish. 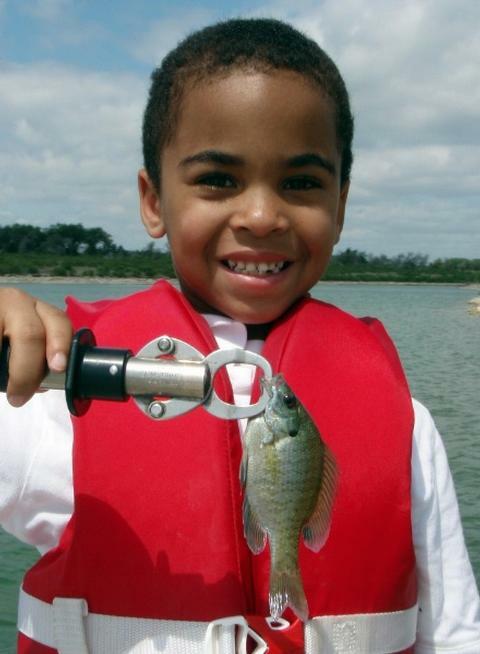 Damian’s first fish was a small longear sunfish that fell for an artificial maggot suspended under a float. 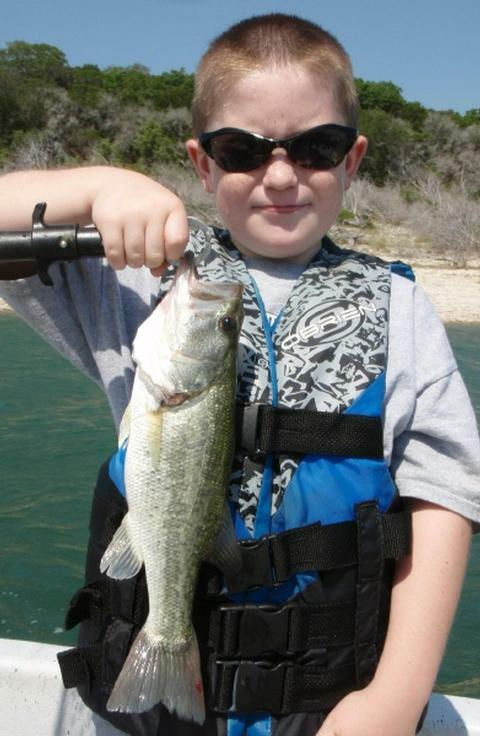 For his accomplishment, he earned a Texas Parks and Wildlife Department “First Fish” certificate. Sisters Brianna and Kailynn had fished before, but it had been a while and they didn’t recall much success on previous attempts. They, too, got in on the sunfish action which featured bluegill sunfish and longears, but no green sunfish today. After 15 fish and at least as many tangles, they began to inquire about “bigger fish”. Due to high winds (again!) our ability to access the waters typically most productive this time of year was hampered. However, we did venture downlake just long enough (between Areas 829 and 062) to boat exactly one “big fish” per kid before “evacuating”, leaving that windblown open water behind. Those big fish included two largemouth bass (one each for the girls) and a white bass for Damian. These fish were all taken on Pet Spoons (1 bass and 1 white on downriggers and one bass on a flatline). We returned to the relative protection of mid-lake and again targeted sunfish boating 3 more before mom and grandma showed up around 11 a.m. Then, it was show-and-tell time. Well, once little Vanessa saw what the big kids got to do, she realized she’d missed out! Mom and I thought it best to put a rod in her hand and to try for a little dockside action to alleviate the situation. Vanessa landed a small bluegill and was quite content thereafter. Now, with all the family gathered on the courtesy dock at boatside, the girls’ final request was for mom to ride on the boat with them, so, out came a few more life jackets, down went the throttle, and we pulled a few figure eights just outside the no-wake zone. Amy had shared that their family’s start at Ft. Hood had been a difficult one, as they had no sooner transferred from the east coast to Ft. Hood than Damian got orders to Korea. So, the family had little time to settle in Texas before saying farewell to dad for a year. But, Damian’s tour ends soon, and they are all anxiously awaiting his return. The kids loved the tackle boxes, blankets, and especially the SKIFF wristbands that are now a part of each trip — you’ll see them in the girls’ photos if you look closely. As always, thank you for doing what you do behind the scenes so memorable days like this can happen for the family members of our servicemen and women!! Wind: Winds were S11 at launch tapering up to S16 by takeout . Skies: Skies were about 70% cloudy. I got a call from Mike S. a few days back and I could tell right away that he’d been bitten bad by the fishing bug. Mike’s a soon-to-retire computer guy, and his dad, Corbin, is a Houston-area insurance guy. Both were good company and we had a great trip this morning. Mike S. (R) with the beefiest of the dozens of white bass we caught today, and proud papa Corbin (L) with our largest hybrid of the trip, a 4.00 pound fish, which fell for a crankbait. As we talked about summertime fishing in general and fishing on Belton and Stillhouse specifically, I could tell he was genuinely interested in every little detail he could glean from our conversation — my kind of guy!! We put today’s trip on the calendar, and then he dropped the bomb — a request that we NOT fish with downriggers as he said he just couldn’t stand trolling. I had to stop and think a bit what I’d do for summertime fishing without my downriggers, as they are typically an integral part of any summer trip once the low-light period of sunrise is past. Fortunately, summertime topwater is getting underway, so, I felt confident that we’d certainly put some fish in the boat in the early morning, and we did. From around 6:10 to 7:30 we continuously had mixed schools of white bass and short hybrid working schools of shad on the surface. We used cork rigs to account for 42 fish the “easy way”. When the topwater died (which it did pretty quickly due to near cloudless skies), the work began. We spotted scattered, small schools of whites and small hybrid in several areas, but not in concentrations leading me to believe that spending time chasing them would be productive. We had about a 90 minute quiet spell where we did a lot of looking with sonar and not a lot of finding. Finally, we located fish in the vicinity of Areas 830/831. As we got settled in and ready to fish, we began to see light topwater feeding, some suspended fish on sonar, as well as a lot of bottom-oriented fish, all in 20-30 feet of water in this area’s undulating terrain. We stayed on top of these fish from 9:15a to 10:45a, boating 39 fish here using a combination of techniques including lift-dropping with bladebaits, blasters, slabs and Sassys, and using slabs in a “smoking” retrieve. 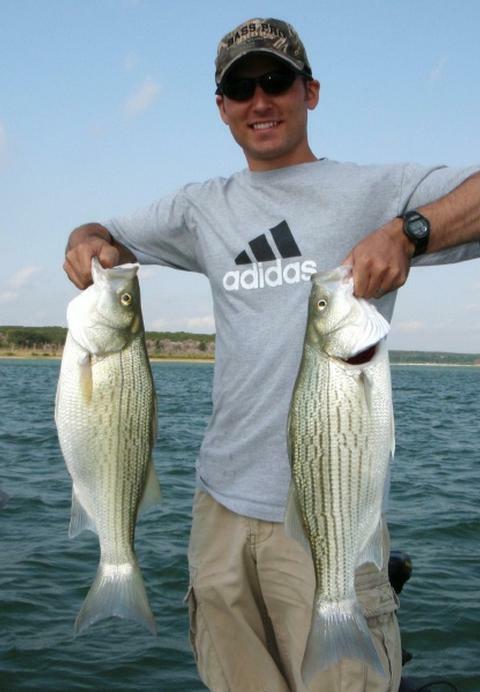 With the exception of an odd blue cat, all of these fish were short hybrid and white bass of mixed sizes up to 13 inches. We saw a classic “bell curve” feed here, gently tapering to near zero by 10:45. Once the fish were all but done, I suggested the fellows grab some snacks and drinks for just a few minutes while I set up downriggers (with their permission, now that we’d had great success without the aid of downriggers!) and at least allow me to show them how to properly rig and run them in conjunction with sonar. During our brief 20 minute OJT session between Areas 472 and 678, we picked up our final 6 fish of the trip, including 3 largemouth bass, 1 white bass, 1 short hybrid, and one nice 4.00 pound hybrid — an eleventh hour “icing on the cake”. Wind: Winds were at S3 by sunrise and staying light and variable from 2-6SW for the remainder of the trip. Skies: Skies were fair, dry, and bright with 20% clouds. This morning I fished a “Kids Fish, Too!” trip for Cub Scouts-about-to-turn-Webelos Garrison L. and Cameron A. from the north Austin area, accompanied by their dads, Mark L. and Chip A.
Cameron with his best largemouth of the day taken from around huge schools of young of the year shad on a Pet Spoon. 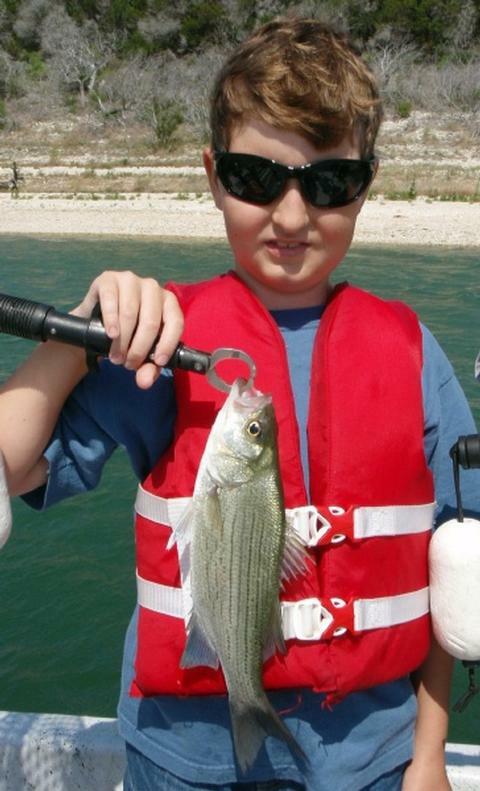 Garrison with one of many downrigger’ed white bass we took today from down around 22 feet. Mark and Garrison have fished with me before on several occasions and, upon hearing that Cameron enjoyed fishing but hadn’t been all that successful on prior outings, decided to invite him and his dad along for today’s trip. As we got started, we did some casting basics using underspin reels at dockside in case we ran into schooling action heavy enough to allow the boys to throw into the fray. We spent about 40 minutes looking closely at the already choppy water for signs of topwater action. We did finally spot several small schools of largemouth in the vicinity of Area 827/8/9, but they were moving fast, appearing only briefly, and in a wind already above 10mph. I cast to the action for the boys and let them retrieve through the schools. Garrison landed 1 largemouth this way and Cameron got two serious follows but came up clean on them. After topwater, and after slabbing, we then broke out the downriggers (variety is the spice of life and all the more so when you’re a young boy!). We downrigged with our ‘rigger balls set at ~20-22 feet for both white bass and schoolie largemouth ghosting along with the abundant bait found along the circuit from Area 821 to 453. The increasing wind (now 15mph+) made boat handling a bit tricky, and bite detection very tough, but we managed to boat 18 more fish in this area, all on Pets, by about 11:00am. We landed 2 largemouth (1 keeper, 1 short) and 16 white bass in this effort. To put one final chapter in this story, we wrapped up with a calmer-water sunfish excursion to a protected cove, fishing in the vicinity of Area 824 with slipfloats and maggots for 14 more fish, including redear sunfish,longear sunfish, bluegill sunfish, green sunfish, and one blacktail shiner. By around 11:30 the sun was growing hot, the boys’ concentration level was diminishing, and it was a good time to call it a great morning and start working on fish stories to tell mom. Wind: Winds were up at S8 by sunrise increasing to S17 by trip’s end. Skies: Skies were fair, dry, and bright. This morning I fished with a father and sons trio consisting of Royce G. (dad) from the Lubbock area, son Nic G. who works for the University of Georgia, and son Jeff who works as a federal game warden on Fort Hood. From L to R – Royce, Jeff, and Nic with the last 4 keeper whites we downrigged for on what was a pretty tough day on Belton. These fellows rented a floating cabin at Cedar Ridge Marina on Belton Lake and booked a morning trip with me to sample Belton’s fishing. I got out well before sunrise and netted shad for this trip then picked them up at their doorstep. We started the day searching what has been a very productive stretch of water from Area 388 to Area 726 with sonar. We saw abundant bait and gamefish holding down at 25-27 feet over a 40 foot bottom. We got twin downriggers working and were onto fish immediately. 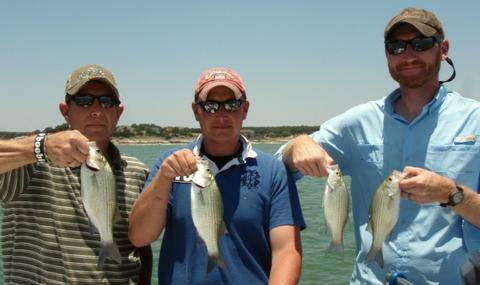 We boated 10 fish in less than an hour’s time including white bass and short hybrid. I stayed in this area hoping that as the sun directly shone on this area that the fish would rise to feed on the surface, but, the chop was a bit heavy and this never materialized. We then headed downlake to sample the live bait situation. We looked over a few stretches of water and actually e-anchored at 3 distinct areas including Areas 682, 815, and 344. Each spot dealt us the same hand — we had abundant strikes on our live shad baits that went ~3″ in length, but for every 1 fish we caught, we lost 2-3 baits to fish that struck and missed or just tail-bit our baits. I suspect very small white bass or hybrid were responsible. We did manage to land 4 short hybrid, 2 blue cat, 1 channel cat, and 1 white bass, but the short strikes were really frustrating. I even tried tail-hooking baits and dropping down several hook sizes, all to no avail. By around 11:00am we decided to change tactics and return to downrigging so as to cover some water for a few still-active fish as the morning bite wound down. We boated 2 white bass on trolled Pets at between Area 347 and the shore, 3 white bass on trolled Pets at Area 84, then headed out and worked a circuit from Area 709 to Area 437 for an additional 7 white bass, all on downrigged Pets. Things were a bit tough today, which seems to be the rule on days that begin with the wind blowing before sunrise. As I’ve looked back over our recent warm-weather period, it seems the better bites have been on days where we start off flat calm and then have winds tapering up toward midday versus tougher days where the wind’s been cranked up since before sunrise. We left the water with 30 fish boated — not a bad day, but Belton has the potential for producing much better in this season. Despite the so-so fishing, the fellows were discussing the possibility of coming out again the following Thursday. We were rigged and ready when a call came in the night before … it was Nic letting me know that Royce had taken a fall while venturing around Lake Travis and broke his wrist, so, our plans abruptly changed. I’m looking forward to getting to fish with these fellows again in the fall. Royce, I hope you get healed up quickly. Wind: Winds were up at S7 by sunrise increasing to S12-13 by midday. This evening I welcomed cousins Margaret Lee and Jarod J. aboard. Margaret Lee, a 6th grader, lives in N. Austin, and Jarod, an 8th grader, lives in Keller, TX. 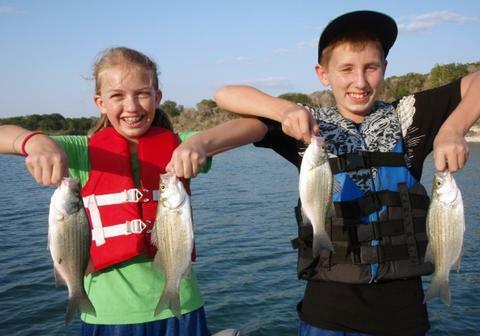 The cousins double-teamed some unsuspecting white bass and largemouth tonight!! The kids’ dads, John and Robert, are brothers and used the trip to catch up with one another as the kids fished. Since Jarod hadn’t done all that much fishing before, we started off with the basics targeting sunfish in shallow water with simple, light gear. In 30 or 40 minutes’ time the two managed to land 17 fish, including bluegill sunfish, longear sunfish, green sunfish, and one black-tailed shiner. We caught these in less than 3 feet of water on balsa slipfloats baiting up with maggots. The second chapter of this story unfolded in deeper water and targeted white bass and school-sized largemouth I’d found earlier in the day along a “circuit” from Area 822 through 453 through Area 820 to Area 821. As soon as we arrived in this area, the bait was again located up high in the water column and so were the fish. We never dropped our downrigger balls below 15 feet despite fishing over 40+ feet of water part of the time along this circuit. Jarod and Margaret Lee really worked well together after we got through the initial learning curve. I steered the boat and kept us in contact with the fish; each of them “claimed” one of the two rods we had working. Once a rod had a strike, one of the kids would reel in the fish while the other would quickly bring the downrigger ball back to the surface, thus avoiding tangling the hooked fish in the gear and getting us ready to get the line back in the water fishing again. Once the fish was boated and released, the person who caught it would get their line back behind the boat the appropriate distance and would then clip the line into the release clip and lower the ball back to the depth I was seeing fish at. As John put it, they were a “well-oiled machine”! This efficiency did allow us to maximize our fish-catching potential here. In about 2 hours’ time, we boated exactly 33 fish here in roughly a 1:3 largemouth bass to white bass ratio. By 6:05, after landing our 50th fish of the trip, I offered a little change of pace for our last hour on the water. I suggested that we could use live bait on downlines to target potentially larger fish, but was careful to warn that the pace of such fishing would be slow and that there were no guarantees on this size. 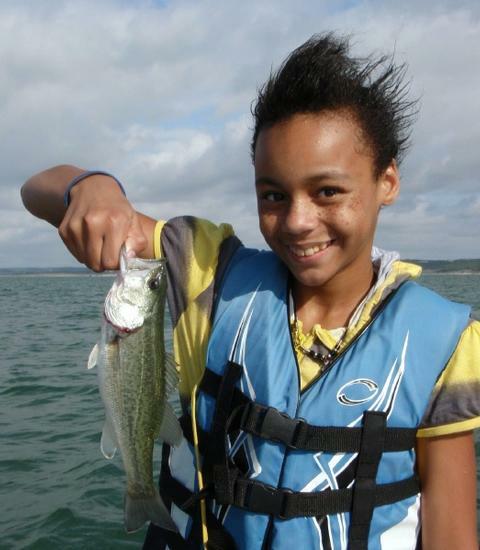 The kids liked the idea of learning a “new method” and so we went in search of monster bass. I checked several areas, finally seeing some positive sonar readings at Area 825. We put 3 baits down and let things settle down a bit. Not long after, our first rod went down, and up came a just-legal largemouth, then another, then another. 3 largemouth in all fell for our baits with 2 others “hitting and missing”. These fish were all “cookie cutter”, right at 13-14 inches. No monsters for us tonight, but, the kids got exposure to yet another way to pursue our finny quarry. Wind: Winds were light from the SSE at around 5 at sunrise, increasing to SSE11, then tapering back to SSE8-9 by 10:45. I had the kind of trip I like best this morning — a father and young son heading out together simply for the sake of spending time with one another. When you converse with folks for 5 hours in a fairly confined space, you get to know a bit about them. I discovered that Brian and Trevor (and his mom!) all perform in Shakespearean productions in the Austin area and have a big “Henry the Fifth” production coming up this summer! Schoolie largemouth like this one and plenty of white bass made for an action-packed morning once the wind started pushing from the south. I met Brian and Trevor M. of Cedar Park, TX, at 6:45am and over the next 5 hours we experienced a very typical summer fishing pattern. The action followed a bell-shaped curve, starting off slowly, building in intensity along with the wind, then, around 10:45 beginning to weaken, then coming to a halt within an hour’s time after that. We began searching the depths with sonar and found precious little at the first five areas we graphed. Finally, between Areas 458 and 823, the ice began to break a bit and, at 21 feet down over a 35+ foot bottom, we saw gamefish moving in and around bait schools. We ran Pets on ‘riggers just above these fish and managed 2 largemouth and 1 white bass here. Subsequent passes showed little else, so, we moved on. We headed to Area 453 (the first time I’ve checked this area so far this season) and graphed a lot of bait in the upper third of the water column. Soon, the gamefish feeding on them began to show, as well. We established a “circuit” from Area 822 through Area 453 through Area 820 and through Area 821 that produced for us on nearly every single pass for about 2 hours’ time. These fish were unusually high in the water column, holding at 11-15 feet down, with schools occasionnally seen at 20-22 feet as well. At one point in time the fish showed so densely on sonar that I stopped the boat and we attempted to throw bladebaits at these fish, but, the fish were oriented on very, very small shad fry and even our small cast offerings were ignored. As soon as we went back to downrigging, we again began boating fish from right out of the school we’d just cast to. In all, we boated 32 fish at this area including 1 drum and a roughly 1:3 mix of schoolie-sized largemouth to white bass. Most of the white bass went right at ~11 inches with some smaller and few larger. The largemouth went 0.75 to 1.25 pounds. Around 11am I offered to either stick with what was working or “roll the dice” and leave fish to find fish in hopes of pinning down some congregated fish on deep structures that could be vertically jigged. We looked over a number of areas without success which did not surprise me given the time and the fact that the wind velocity had already peaked and was tapering off a bit. We did not find the fish we thought we might and so wrapped up our trip with our count standing at 35. Trevor noted an interesting trend developing early in our trip. It seems that anytime one of the three of us decided to have a snack, the fish would bite. So Brian (with the slower metabolism of the pair) encouraged Trevor to snack regularly to test his theory out. Never one to do without a granola bar now and again, I also felt obligated as the guide to see if this thing could indeed be true. We really never reached a conclusion … nor did we leave the lake hungry, so, all was well! This morning I paired up with First Lieutenant Matt H., a recent West Point graduate now serving in harm’s way performing route clearance missions with his combat engineer unit in Iraq. Matt is home on R&R a bit sooner than the typical half-way point of his tour so as to spend his 3rd wedding anniversary in the U.S. with his wife. Matt holds our two largest hybrid which both struck large gizzard shad live baits just seconds apart. The larger of the two went 5.75 pounds and the other weighed 5.25 pounds. Both were released. Matt arrived earlier than most folks as he wanted to join me for the “trip before the trip” — netting live bait for pursuit of hybrid striped bass. We put exactly 71 suitable baits in the bait tank in about 15 throws (more throws than have been necessary lately). The pre-dawn breeze prevented spotting shad as they “flicked” on the surface, so, I had to make a lot of blind throws. As we headed out in pursuit of gamefish, I looked hard along the stretch of lake from Area 388 to Area 726. There has been a good bit of topwater action in this area from white bass feeding on newly hatched shad. The feeding, even on slick water, is light, and with this morning’s wind there was no action to be seen. Regardless, we watched sonar closely and saw schools of fish beginning to form and patrol at 20-25 feet over a 36-40 foot bottom. This was perfect duty for the downriggers. We put on dual White Willow spoons and went to work. Our first two fish came just seconds apart and immediately after we passed over a huge school of fish right on Area 819. Based on the size of the school and its spread from near surface to near bottom, we stopped and began using jigging spoons on these fish. The active fish and 40 water called for a 3/4 oz. TNT 180. We boated a total of 28 more fish here over the next hour or so as smaller schools of 15-20 fish would intersect our path in the vicinity of Area 819. During this bite, Matt boated his first hybrid ever. By around 8:40 the action was weakening, so, we set out in search of hybrid with our live shad. We fished mainly around Area 691 in ~25 feet of water both by e-anchoring and by drifting with a sock out. Our first action came as a double header as a nice pair of 5+ pound hybrid struck 2 of the 3 gizzard shad we’d set out. Matt picked up the rod with the largest fish (5.75 pounds) and I moved the other rod with a fish attached to it to the furthest rod holder from Matt to keep it from interfering with his efforts but still allow him to catch it after his first fish was landed. 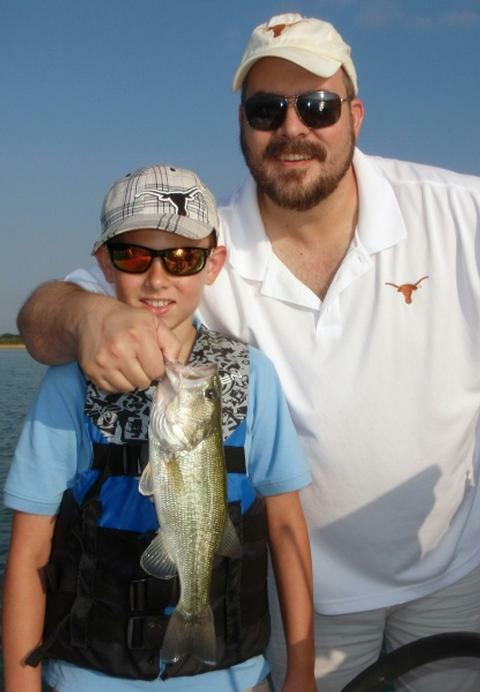 Matt did a great job fighting the fish and landed both successfully — 5.75 pounds and 5.25 pounds. We would go on to catch one more keeper hybrid here on shad as well as one 15″ largemouth. When the bait bite shut off around 10:30, we spent another 40 minutes downrigging this area adding another 5 white bass to our tally. By now it was around 11:30 and things were getting slow. We checked a number of additional areas but did not find any more active fish for our efforts. So, we closed out our day with 40 fish even, including 3 nice keeper hybrid and some good memories for Matt to take back to Iraq. Along the way Matt got experience in the methodology for netting, handling, and keeping shad, a hands-on lesson in downrigging (which he got really good at very quickly), and experience with using a smoking technique with slabs and a lift-drop technique for Sandblasters. Matt and Jennifer, Happy Anniversary! Thanks for coming out with me! Wind: Winds were S6 at sunrise increasing to S12 by mid-day. Bittersweet would be a good way to describe today’s trip. A few weeks ago Matt W. of Georgetown,TX, contacted me. His 63 year old dad, Mark, had gotten word from the doctors that his time here would soon draw to a close. Matt asked me to help make some memories for his dad and him by putting them on fish. Matt (L) and his father, Mark (R) with our best fish of the trip. A hybrid downrigged from a suspended school of fish down 29 feet over a 40 foot bottom. It fell for a White Willow spoon. Matt is a very good fisherman in his own right; he owns his own boat, can interpret sonar, and is consistent in boating fish on Lake Georgetown. However, on this trip he wanted to focus on his dad, not handling the boat, the bait or the gear, nor worrying about where the fish were or were not. So, he left those things to me and got to be attentive to his father, to setting him up for success, and enjoying it with him when it came. As the day drew nearer, I was concerned given the forecast for bright, clear skies and light winds from the north. What actually materialized was a light SE breeze at 1-2 mph, and some early morning haze that kept the sun’s intensity somewhat reduced until it burned away by 9:30. I arrived a bit more than an hour ahead of our scheduled 6:45am meeting time to net shad, and, as I looked about for signs of fish and bait as I traveled about for shad, I saw the beginnings of some topwater action between Areas 388 and 726. I met Matt and Mark, we got all the gear situated, etc. and then headed back to the “scene of the crime” to see if the topwater action was going to continue. Well, continue it did!! For over two hours there was never a time when a school of white bass was not within casting distance. These whites (most smallish) were oriented on the nomadic schools of newly hatched shad just drifting about pushed by the light currents and light winds of late. It was not uncommon to land a fish only to have it regurgitate one or more breakfast items at boatside. Several times we actually had fish we’d landed still holding live baitfish in their mouths. To capitalize on this action we kept our presentations subtle, using small bladebaits and Cork Rigs with appropriately sized shad-imitators tied on the business end. Occasionally, we’d see heavy schools of fish suspended just off the bottom at up to 30 feet over a 40 foot water column. Matt and I dropped 3/4 oz. TNT180 slabs into these fish on a few occasions and came up with better quality fish including larger whites and one short hybrid. The focus, however, was on Mark and his success. He was “in the groove” accurately casting to surfacing schools of whites, and that required that I continuously maneuver the boat to keep us within casting range, thus not really allowing for a vertical presentation. 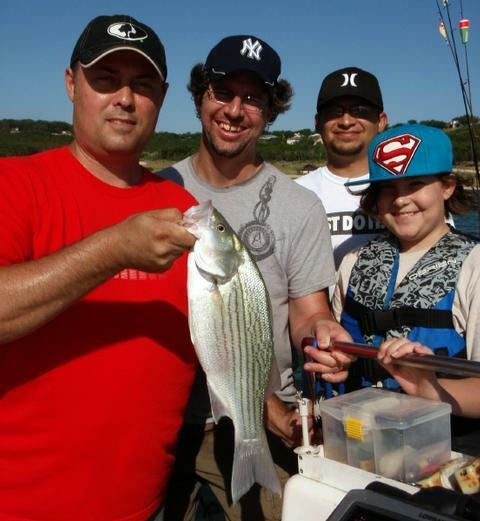 By 9:30am we’d boated exactly 114 fish including 113 white bass and one short hybrid. The topwater bite had nearly completely died, but, we could still see schooled fish suspended down deeper, so we geared up the downriggers and targeted these fish. We used “White Willow Spoons” in opaque white to tempt these suspended fish. 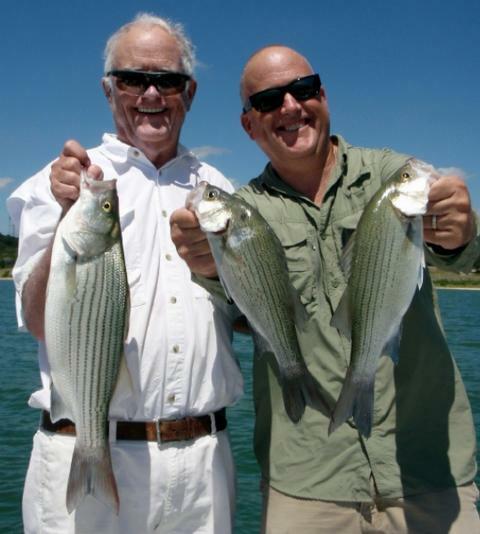 No sooner did we get lines down than we hooked up a double on a pair of white bass. Our 3rd fish was our largest of the day, a ~19 inch hybrid. I saw the rod tip twitch just an instant before the fish tore the line from the release clip and headed north on a tear. 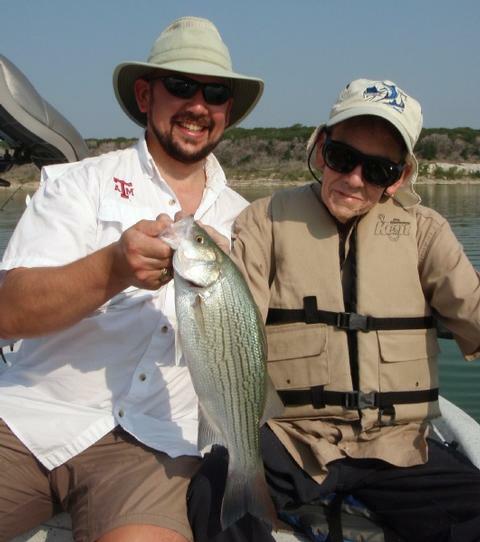 Matt reacted, grabbed the rod from the holder and passed it on to his dad. Mark did a great job of fighting the fish, letting the rod and drag do what they’re intended to do, and brought the fish to net handily. We released that fish and continued downrigging. We boated two more whites — one of which came as Matt was rigging his line and as the bait was still skimming along just beneath the surface. By 10:15 these fish were done and we moved on to give live shad a try for some additional hybrid. We got set up and I was about to put some chum down when Mark let us know that he thought it prudent for us to conclude our trip so as not to push his limits on this hot, dry, windless late morning with the sun now really bearing down on us. So we brought the gear in, cranked up, and made our own breeze heading 30 mph back to the dock to get Mark into the air conditioning. I had a chance to speak with Matt before he and his dad departed. In my “other life” in ministry, I see a lot of examples of children, including adult children, failing to honor their father and mother and how this failure to follow the Lord’s guidance leads to family problems, hard feelings, and worse. I let Matt know how refreshing it was to see a son look after his dad now that, through life’s circumstances, their roles were reversed. Matt was really selfless, attentive to his dad’s needs, and genuinely wanted this trip to go just right knowing full well it’d likely be the last one they made together. Some days, all goes according to plan … today, it went even better as Mark got in one last cast. Wind: Winds were light at 1-2 SE for ~ 2 hours after sunrise, then went slack and glassy.